Understanding Mental Disorders: Your Guide to DSM-5® is a consumer guide for anyone who has been touched by mental illness. Most of us know someone who suffers from a mental illness. This book helps those who may be struggling with mental health problems, as well as those who want to help others achieve mental health and well-being. 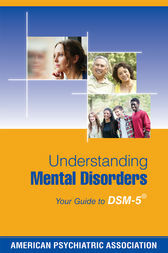 Based on the latest, fifth edition of the Diagnostic and Statistical Manual of Mental Disorders -- known as DSM-5® -- Understanding Mental Disorders provides valuable insight on what to expect from an illness and its treatment -- and will help readers recognize symptoms, know when to seek help, and get the right care. Featured disorders include depression, schizophrenia, ADHD, autism spectrum disorder, posttraumatic stress disorder, and bipolar disorder, among others. Understanding Mental Disorders is a companion volume to the DSM-5 designed specifically for the general public -- and it is a wonderful companion volume that nonphysicians, especially patients and families of the mentally ill, will appreciate. The writing is exceptionally clear, and the absence of jargon that often adds mysterious complexities makes this volume valuable.